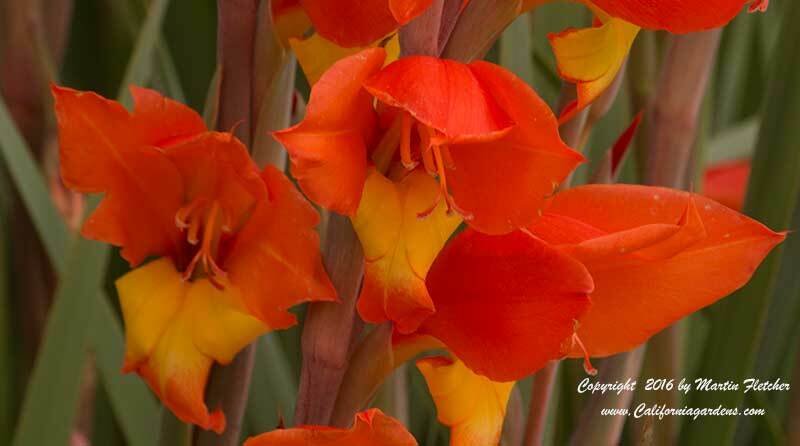 Gladiolus dalenii brings brilliant orange and yellow Fall flowers to a garden. This Gladiolus has been in cultivation for a long time and the Corn Flag is a parent in many of the modern Gladiolus hybrids. Gladiolus dalenii comes from Southern Africa. It is used in traditional medicine. Gladiolus dalenii prefers adequately drained soil and can get by on a very infrequent irrigation schedule. Three orange and yellow Gladiolus dalenii flowers - Corn Flag. High resolution photos are part of our garden image collection.